In-person events such as trade shows are an incredible way to garner new clients and customers, as well as, network with others and promote your brand. Business owners have a tough time finding the right events, not to mention, preparing a trade show plan and deciding the right sales and marketing collateral to bring. In this article, we’ll attempt to answer the questions surrounding how you prepare print material for a trade show, and what type of print collateral you should bring with you to the event. Plan your work and work your plan is a common euphemism for a reason, and trade shows adhere to the same principle. 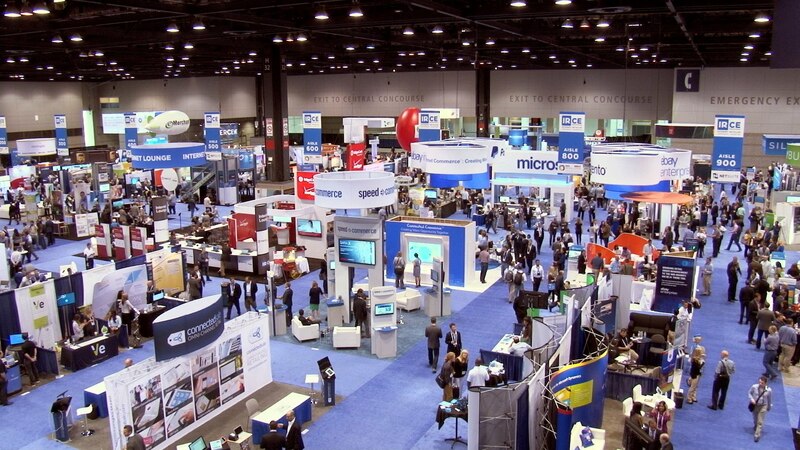 You should develop your trade show budget early on, which should encompass your booth space, your exhibit, banner displays, and sales and marketing collateral. Print collateral at a trade show is practically mandatory, as you need something tangible that your potential clients can bring back to the office with them. Planning your print order ahead of time can go a long way, and giving your printing company advanced notice will save you money on your order. Additionally, you will want to review and proof your printed display material and other literature a month before the actual event to ensure there are no issues and that your print material is exactly what you ordered. Deciding which print material to bring to a trade show weighs largely upon your goals in conjunction with your budget. At a bare minimum, you will bring plenty of business cards, a banner for your booth, and printed sales brochures to your trade show. Additionally, having printed table talkers can add catchy visuals and messages to otherwise flat, blank surfaces. Moreover, table talkers are an excellent way to start the conversation and if designed correctly can supplement your banner adding to the visual appeal of your trade show booth. Loyalty Cards: By offering loyalty cards to your booth visitors, you’re giving them a reason to follow up with you once the tradeshow has ended! Custom Order Forms: The ideal situation for trade show attendees is meeting a customer who desires to sign a contract on the spot. Consequently, ensure that you bring plenty of order forms for just such an occasion. Branded Notepads: Not only are branded notepads practical for a trade show event, but they also allow your company to stay “top of mind” as they are likely to end up on your potential customer’s desk. Lead Cards: Lead cards are a phenomenal way to capture information from your visitors and offer your sales team a warm lead when you arrive back to the office. Promotional Items: Offering free, branded gifts to trade show booth visitors is a given in today’s day and age. By designing and printing customized promotional items, you can continue to promote your brand long after the trade show has ended. Make sure your Display and Print Material Pops! No matter what type of printed sales material that you bring with you, it needs to serve its main purposes of catching the eye of trade show attendees, engaging and drawing individuals into your sphere of influence. Digitally printed material that showcases your brand in a unified and creative way will ensure that your trade show is a success. Have a trusted printing partner with turnkey printing capabilities can allow planning for and attending a trade show much easier. Having a printing company that understands your business needs can make procuring your trade show banners, displays, and giveaways, much less of a headache. Additionally, having a printer who understands the fundamentals of visual merchandising will be able to turn your creativity into a reality and guarantee that your trade show is an unforgettable event that creates a positive first impression on new customers. Acme Printing exists to give you the best printing experience possible. If you ever have any questions, please don’t hesitate to call us. We look forward to working with you and helping you create stunning print material for a trade show, or any other occasion, that requires engaging, purposeful, and create print services. Give us at call today at 423-581-8528 or toll-free at 855-581-8528; or send us a message HERE, and one of our team members will get back with you shortly!